ZMesh systems provide quiet, constant, and uniform heat under cold surfaces leaving them comfortable to the touch and adding unseen elegance to your home. ZMesh will heat the floor as well as the objects around it resulting in balanced heat through out the entire area room. Eliminate dangerous icicles and damaging ice dams effectively with ZMesh Roof Deicing Systems. Heatizon's ZMesh is installed directly under your roof covering protecting your investment from leaks and ice dams without sacrificing the aesthetic beauty of your roof line. Our roof de-icing products are the only way to permanently protect your investment from winter woes. Because of ZMesh's extremely low profile, any application where ZMesh is used, it becomes undetectable to the naked eye. 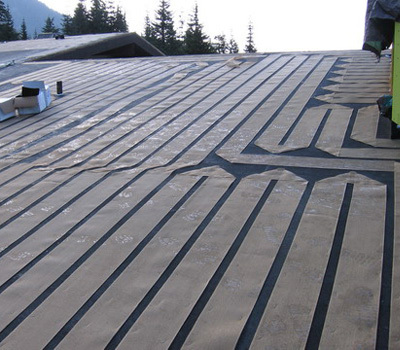 No unsightly cables on your roof, no floor buildup, just a consistent, reliable radiant heat. 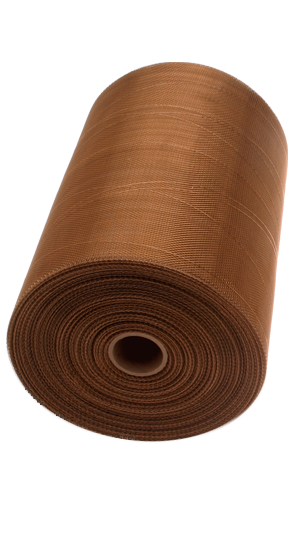 ZMesh is the best solution to under roof and under flooring radiant heating applications. Stop ice dams and the resulting roof damage before it happens with ZMesh. Heatizon's ZMesh installed underneath a non-metal or membrane roof will create a ice removal solution that is invisible and effective. Heat your floor/space more efficiently than ever before. 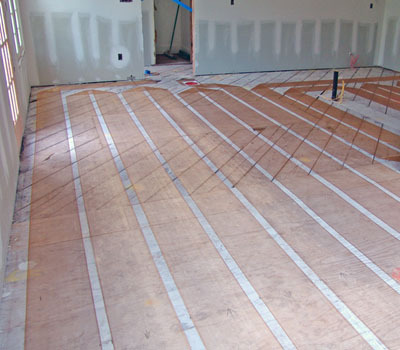 Create an invisible floor/space heating solution that causes no floor build up. Not to mention that it will warm the floor/space comfortably for years to come. Heatizon's ZMesh is authorized (UL 1588) to melt snow and ice while being installed UNDER roofing materials. Heatizon's ZMESH kits come ready to install and customized to each project. This kit provides the backbone and mounting for a ZMesh system. Several options of control unit are available for specific ZMesh solutions. Paired with your system to provide precise amount of power. An device that makes using the ZMesh system easy and efficient. Cold lead and transition plates come standard with every ZMesh kit. Cut/splice kits are available for ZMesh to handle obstacles. Heatizon and their distributors are always willing and able to offer support for ZMesh. "...Heatizon ZMesh was installed under a new floating wood floor in the living room and dining room, plus under tiles in the kitchen. For the first time in 12 winters, I looked forward to coming home...to a quiet, toasty, warm house. Each morning it is delightful to step onto heated tiles. No more slippers! Sitting on the floor to watch TV is like being wrapped in down. Our heat is constant, cozy, comfotable, quiet, and even eliminated space heaters in the upstairs bedrooms." "After heating 700 square feet of remodeled basement for two months with ZMesh as the only source of heat, I thought I should send you an email letting you know how satisfied I am with your product. I am pleased to say with the ZMesh installed, my basement floor is warmer than my upstairs floors. It has made my basement floor the center of activities for this cold winter." "We just want to tell you how much we enjoy our Heatizon System. We live at 5300 feet, and in a canyon, so we have given the system a "work out" to keep our home warm. It is marvelous to pad barefoot across hardwood and tile floors and have the floors warm and cozy feeling."